This is an unusual free flash wall clock that shows you 24 hours time in one revolution of the hour needle in this wall clock, which you will not find anywhere. The unusual behaviour of this flash wall clock is only restricted to the hours needle. The other wallclock needles behve normally like the minutes needle will continue to show you the minutes exactly as you would read time in minutes in any other analog wall clock. Similarly the seconds needle which is a rotating circle in this flash wall clock is also showing you the correct time in seconds. What is Unusual in 24 Hour Wall Clock ? Nothing much is unusual except that the hour needle will rotate only half the angle any other analog wall clock hour needle would be rotating in the same time. In fact the hour needle points at half the angle at any given time or hour. Why You Can Not read 24 Hour Wall Clock ? MatsClock 2400 which is an Unusual 24 hour wall clock is difficult to read because, you are used to seeing the hour needle of any analog wall clock at a certain angle, you actually never bother to read what is written on the wall clock dial. Over the period of time you have learned to recognize the position of the analog wall clock needle to find out the time. Your brain takes absolutely no time to decipher the time shown by the needle. Amazingly you can read time on an analog flash clock even if there is no numerals by just looking at the analog wall clock needles indicating hours and minutes. The small thick needle indicates hour on analog wall clock and the long needle indicates minutes. The needle that is thin and rotating fast obviously is the seconds needle on the analog wall clock. Now carefully look at the numerals on MatsClock 2400 which is a 24 Hour WallClock. Do you find the difference? Why is it difficult to read 24 Hour Wall Clock ? When you look at this unusual 24 hour wall clock, your brain will continue to decipher the time based on the angle each of the needles show you. If you look carefully, the hour needle indicates an angle which your brain understands but the numeral it is pointing at is double that value. So either you need to practice reading the 24 hour wall clock or look at the numerals which the 24 hour analog wall clock hour needle is pointing at. Initially you will find that 24 hour wall clock is confusing and really unusual. Read time a few times on the 24 hour unusual free flash wall clock and you will become comfortable and in fact you will start liking Unusual 24 hour wall clock compared to the 12 hour analog falsh wall clock. Why Unusual Wall Clock 24 Hour ? The 24 hour wall clock is used by the railways, the ships at sea, the airports and pilots etc. Inside a ship where there is no windows in the cabins under water like the ships engine room, boiler rooms for example is always lit up with electric lights as the sun light cannot reach inside the ship. Thus they have to look at the wall clocks to see the time. But these wall clocks do not say it is am or pm. So the sailors have to make a guess or ask someone else to confirm it is day or night outside the ship because some sailors never come out from the time they left a port till they reach another port. The other reason is that in 24 hour wall clock there is absolutely no confusion weather you add am or pm because 2300 hours means 10 pm and 1000 hours means 10 am. Why is 24 Hour Wall Clock Preferred ? The 24 hour analog wall clock is preferred by airports, pilots, captain of sailing ships and railways because there is no confusion when you say the time of arrival of a ship, aircraft or plane when the 24 hour wall clock format is used compared to 12 hour wall clock format. For example if you say 12 am or 12 pm many a times it is confusing. Similarly 1 pm is actually day but 1 am is after mid night. When a aeroplane is expected to land at 1600 hours there is no confusion. The aeroplane will arrive at the airport at 4 pm. But the time turns 4 O" clock twice a day at 4 am and 4 pm which could be confusing. So 24 hour wall clock format is unambiguous and therefore is used world over in all airports, aircraft, trains, railway stations, ships and ports as the preferred time format. Moreover it is easy to calculate time duration between two different times in a day using 24 hour wall clock format than using am pm method. By the way what is the time duration between 3 am and 4 pm ? But if I were to ask what is the time duration between 0300 hrs and 1600 hours the answer is very evident, it is 11 hours gap. I am sure you agree and have already started liking my unusual 24 hour wall clock. 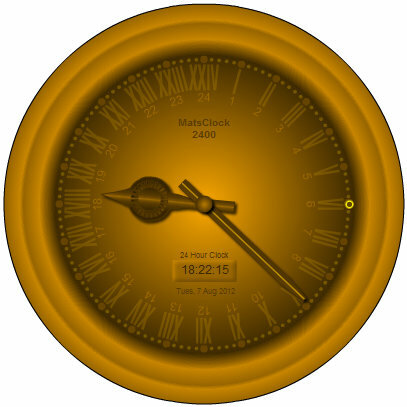 Why is Unusual 24 Hour Wall Clock Golden Color ? Silly question, but here is the answer. A day has 24 hours. MatsClock 2400 also has 24 hours. Remember that the President of your country and every one else including you have only 24 hours to spend in a day. Time is like a bank balance that can be compared to a 86400 litre water tank which has a leak of on litre a second and will finish in 24 hours. You cannot stop time. But you can certainly use time to your advantage. Imagine you have 24 hours with you. You can either sleep the whole of it, exercise, work, study, enjoy, take a long bath, waste in gossip or anything you want. As long as you are using the time you have conciously to be productive which every human being should be, then it is fine, other wise just look at the time getting wasted looking at MatsClock 2400 the Unusual 24 hour wall clock. Time is thus very precious and more precious than Gold and thus I designed the entire 24 hour analog wall clock in gold.